Paramedic Rey Mopas and Gerald Raquel, an emergency medical technician with American Medical Response, unload their ambulance in front of Castle Medical Center in Kailua. Oahu responders got 72,910 calls last year -- up by 4,326 from 2004 -- amid a construction boom that brought many new residents to the island and a record tourism year that attracted 7.5 million visitors to the state. The department recently got two new ambulances -- the first addition in 10 years -- for a total of 20 vehicles. Thicker traffic, sprawling communities and more calls for help are challenging island ambulance drivers to arrive in time to save lives. Response is slower on the Big Island than it is on Kauai, Maui or Oahu, but officials in all areas have felt a rise in demand for emergency services in recent years. Emergency crews need to meet a state standard that gives them 10 minutes to respond to emergencies in urban areas and 20 minutes in rural areas, at least 90 percent of the time. The clock starts ticking after crews are given two minutes to get ready and be on the road. On the Big Island, with 15 ambulances in 19 fire stations, response times last year ranged from six to 17 minutes, with one response taking 24 minutes. "We are seeing some delays in response times," said the county's fire chief, Darryl J. Oliveira. "The island is experiencing a growth spurt, and for us, on our island, the growth is not limited to urban communities. A lot of it is happening in the rural communities." Oliveira said that as demand increases, units once sitting at stations waiting for calls are now being forced to respond from "one end of the district to the other." "As call volumes go up, that will also increase staffing," he said. Oahu responders got 72,910 calls last year -- up by 4,326 from 2004 -- amid a construction boom that brought many new residents to the island and a record tourism year that attracted 7.5 million visitors to the state. Emergency crews on Hawaii's most densely populated island were still able to meet the time requirement, said Patty Dukes, chief of emergency medical services. Dukes said the department recently got two new ambulances -- the first addition in 10 years -- to bring Oahu's total force to 20 vehicles. The department also plans to shift from recording response times on paper to an online database by March to better analyze its performance. Last summer, responders at the department's Makakilo station started working 24/7 instead of 16 hours. Dukes said the change was made so that crews can handle calls from the growing Kapolei area, which is being developed as Oahu's second city on the island's Ewa plain. "We needed the coverage in that area at midnight. It was a brilliant, brilliant choice," said Dukes, a 23-year department veteran. Kahuku is considered the only "pure rural" area on Oahu, Dukes said. It has the longest response threshold, 20 minutes. Kailua, Kaneohe, Kapolei and Waianae all are urban-rural, meaning responders are expected to reach those areas in 15 minutes. An optional national standard set by the Commission on Accreditation of Ambulance Services is just nine minutes, according to the American Ambulance Association, which works to improve medical transportation and emergency medical services. Dukes said response times are "a hotly contested subject," and she feels the state standard of 10 minutes is appropriate. Demand for emergency services on Maui and Kauai have also gone up, said Speedy Bailey of American Medical Response, the sole provider of ambulance services in those two counties for the past 25 years. He said the company has been able to meet the state's response requirement by tracking planned developments and predicting how services will be affected. "I think we've been successful at identifying the areas of growth," said Bailey. "We look at that continually and make recommendations if there's growth potential and changing demographics that are affecting response times." "We have never been cited" for having responders exceed the state's time standard, he added. Kauai, which once had just three emergency stations, now has five 24-hour centers staffed with a combined 30 full-time workers, Bailey said. Maui, a four-island county with 10 emergency stations, recently added 36 ambulance hours and received a helicopter service in September 2004, he said. Dukes said training for ambulance drivers has been more rigorous to help them safely weave through worsening traffic jams. "We have the magic lights and sirens, which is something that everybody wishes they had," she said. "We've had to have this awareness in our personnel driving habits, because there's so many more people on the road ... We have to be more on the alert for potential collisions." But Dukes said the most pressing concern involves the fleet of 12 Army helicopters that will no longer be available to help with emergencies beginning April 1. The Black Hawk helicopters will train for a deployment to Iraq this summer and be unavailable until at least October 2007. "They fly over all the traffic, and we drive through it," Dukes said. "We will feel the biggest impact when we have multi-patient events." If a major emergency occurs, Dukes said, helicopters can load five or six patients per flight, but an ambulance is limited to three patients on stretchers. "We won't be able to put as many people in one car. We'll have to bring our other ambulances from the outlying areas," she said. "That will take a little bit longer, and it will take an ambulance out of its area." House and Senate lawmakers are asking for $600,000 in seed money to help keep emergency helicopters flying on Oahu. The money would go to the state Department of Health to develop a new contract with another government agency or U.S. military unit to provide the service. On Farrington Highway heading toward Waianae, this ambulance bypassed Waianae-bound traffic by traveling in the opposite lane. 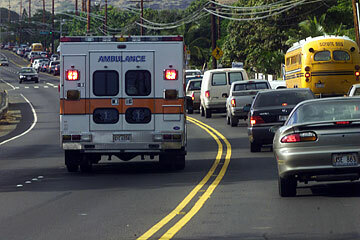 Ambulance drivers are receiving more training to help them navigate Hawaii's traffic jams. 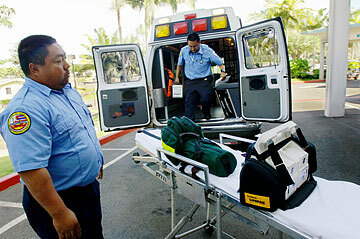 » Waiting for help: The wait for an ambulance is shorter on Oahu, Maui and Kauai than on the Big Island. » Get out of the way: Ambulance drivers have been receiving more rigorous training to help them weave through worsening traffic jams. » Urban vs. rural: Growth is slowing down service in urban areas, but rural areas also are growing, demanding longer trips for limited emergency crews. » 911 dispatchers find out what service is needed: police, fire or ambulance. » If an ambulance is required, the call is transferred to an Emergency Medical Services dispatcher, who has 30 to 90 seconds to get details of emergency and the address. » Ambulance drivers and paramedics have to be on the road within two minutes, then have 10 minutes to reach the scene in urban areas, 20 minutes in rural areas.